Grapevines dressed in fall colors once graced the covers of phone books and promotional posters for wine country. But grape leaves aren’t supposed to turn color in the fall. These were sick plants, infected with a debilitating disease that reduced fruit yield and quality. Grapevine leafroll-associated viruses—there are at least six of them—trigger a biosynthesis pathway in grapes that makes them produce red pigments, called anthocyanins, in their leaves. Those are the same pigments that make red grapes red. White grapes lack anthocyanin, so they don’t show the same symptoms but they, too, suffer from the infection. 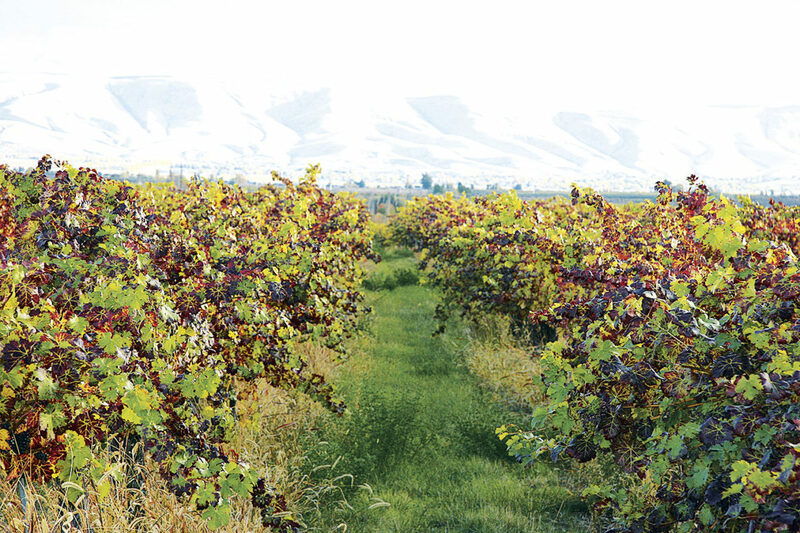 fine wines and eastern Washington had the perfect climate to cash in by planting thousands of acres of new vines. But leafroll viruses were throwing a wrench into the works. With most plant virus diseases, Rayapati says, “you’ll see symptoms of infection in a matter of days or, at most, weeks.” But with leafroll, symptoms don’t appear until veraison, the onset of berry ripening. What appears to be going on, he continues, is that “there is some kind of linkage” between the seasonal stage of the plant and the expression of symptoms. As berries begin to mature, a profound change occurs inside the plant. Most plants have two sets of plumbing. With grapes, the xylem moves water and metabolites through the plant for most of the season. But once ripening starts, the other set of pipes, the phloem, comes into play as sugars are moved from leaves to ripening berries. Leafroll viruses appear to hide out in phloem cells. Just at the time when the phloem tissues are supposed to be transferring sugar to berries, they aren’t. “It’s like a clog in your drainage,” explains Rayapati. Over a period of years, yields get smaller and grape quality is reduced. “It’s a kind of cascading effect,” he says. As WSU researchers have shown, the economic impact, measured over time, is dramatic. Having tracked the spread of leafroll infections over many years, Rayapati knows that some of the viruses are vectored by mealybugs. If a grower plants a new block of vines next to one that is already infected, they see a gradient pattern as bugs fan out into the new block, carrying the infection with them. Unfortunately, there is no cure—yet. While Rayapati and his colleagues are working on that, they offer growers practical management advice. First and foremost, know where your planting material comes from. Make sure it is tested virus-free—and then work with your neighboring growers to keep plants healthy. This sometimes means the admittedly expensive act of pulling out infected vines and planting new ones.